The 2013 Conference Planning Committee is seeking input from the NCHN membership, Business Partners, and the various HRSA Rural Health Network Development Grant Programs participants. The 2013 Annual Educational Conference will be held in New Orleans, Louisiana from Tuesday afternoon, April 16, through Friday morning, April 19, 2013. Please assist the 2013 Conference Planning Committee with their important task of planning the best NCHN Conference by taking a few minutes to provide some feedback to the Planning Committee. Also, one of the responsibilities of the Conference Planning Committee is to make recommendations on the location of future NCHN Conference sites. Please provide some input to the committee where you would like to see future NCHN Conferences and meetings held. On a road trip to the Rocky Mountains, the Smith family experienced something interesting. They live in Montana, so they traveled westward on a day long trip there, where they would stay for 5 days and then travel back home. On their trip they decided that they would watch the sunset each night. So, they did! But on one of the nights, their sunset watching was especially fun. This is because they watched the sun as it set three times! How did this work? The National Cooperative of Health Networks Association (NCHN) invites NCHN members, Business Partners and guests with an interest in health networks to submit proposals for presentations at our 19th Annual Conference that will be held in New Orleans, Louisiana, April 16-19, 2013. The 2013 NCHN Annual Conference: “All that Jazz!” is an excellent opportunity for network leaders to gather and share with their peers. collaboration/creating partnerships with other organizations, such as, local and state agencies, networks, other federally funded projects, etc. written communications, e.g., developing ROI reports, newsletters, websites, etc. The target audience at the NCHN conference is Network Leaders, network staff, and network board members. NCHN member success stories of innovations; best practice models, new product/activity development; sustainability; strategic planning; board management; and other topics related to the developing and maintenance of a successful health network are also welcome. Mini-Workshop Session- approximately 15 minutes; given at beginning or end of plenary session; and must have a tool and/or take away that network leaders can implement into their own network. Concurrent Session– approximately 70 minutes; 20-25 participants; must include audience interaction; must provide participants take home tools that can be replicated within their network; can include more than one presenter. Plenary Session – approximately 45 - 60 minutes, all conference participants; an informative, information sharing type presentation; includes take aways for the participants; question and answer period at end of session; and may include more than one presenter in a panel setting. Topic must be an overall general management topic relevant for all types of networks. Horizontal Networks are organizations comprised of all like organizations, for example, a hospital network. Overall General Management – sessions that address management issues of a network organization, no matter organizational type of network. Presenters are responsible for all expenses related to delivering the presentation, if selected to present, including travel, lodging and meals, and the conference registration fee; however, non-NCHN member presenters may register for the conference at the membership rate. The 2013 Annual Conference Planning Committee reserves the right to make final decisions on the selection of all presentations. Presentation applicants will be notified by December 15, 2012 if selected to present, so that travel arrangements can be made. The 2013 Conference Planning Committee looks forward to your participation! Proposals must be submitted electronically by October 17, 2012. Welcome to a new season! We are holding our September Coffee & Tea Chat with Dr. Mary Kay Chess on Wednesday the 12th at noon (ET). Let's spend some focused time talking about the responsibilities of the Network Board and, the potential goals of a Network Board. We have posted on the Coffee/Tea Chats section on the NCHN on-line forum a sample tool for tracking the progress and success toward meeting the goals. Often, boards blur the borders of "accountability" - their accountability and the goals of the network. This conversation allows you to talk about successful board actions, learning opportunities for boards and an adapted "balanced scorecard" as a tool to measure board progress on their own, internal strategic plan. We look forward to hearing your perspectives during our conversation in September! We have posted the document on the NCHN website in the Members’ Only section, under Member Resources >Documents > NCHN Information > “September Coffee/Tea Chat – Network Balanced Scorecard.” If you need assistance accessing the document for the call, please contact Christy at csullenberger@nchn.org. Call in details were sent via email Monday morning. The Program Development Committee is extremely pleased to announce that HIMSS (Healthcare Information and Management Systems Society) has invited NCHN members to participate in their upcoming “Meaningful Use Stage 2 and the Standards and Certification Criteria Final Rules: A Three-Part Series” produced by HIMSS Media Group. The series will be held at 1:00 PM ET on Tuesdays, September 11, 18, and 25. NCHN members can register for the calls at no cost (a savings of $237). 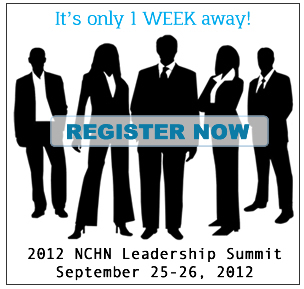 The link to the registration form was sent to NCHN Members on Monday. If you did not receive the email, or need assistance, email Christy. October 1, 2012 (RWHC's Eye on Health) - I love my digital video recorder, during election season more than ever. It is great to record favorite shows for watching whenever you want to. And it preserves my aging sanity to be able to click forward over the endless televised political tantrums. NCHN is pleased to announce its partnership with Equipment Management & Technology Solutions (EMTS), a privately owned corporation which works to help clients reduce the costs of capital equipment acquisitions and related service agreements. EMTS is a Silver Level Partner. Look for more information in the September issue of the NCHN e-News. EMTS' mission is to help their client’s reduce the costs associated with the acquisition, on-going service, and valuation of all types of capital equipment. National Presence - Presently have approximately 450 healthcare facilities under contract in 37 states. Healthcare Focused - 100% of their revenue comes from their healthcare provider clients. "ONC- HRSA Webinar: Demo of the New ONC Privacy and Security Training Game and Program Update for Safety Net Providers"
"Leadership Tips During A Health IT Implementation"
To set the stage on the key health IT challenges facing rural and underserved communities, NeHC will welcome Earle Rugg, CEO of Rural Health IT Corporation, and Chantal Worzala, Director of Policy for the American Hospital Association. Mr. Rugg will describe the demographics and characteristics of rural and underserved communities and describe the key health IT challenges they are facing. Ms. Worzala will discuss the status and trends of EHR adoption in small hospitals, nonteaching hospitals, and rural hospitals to demonstrate that adoption of health IT lags in rural communities. Ms. Worzala will also describe the importance of rural hospitals to the communities they serve and how their role indeed differs from their counterparts in urban areas. Mr. Rugg and Ms. Worzala will also highlight examples of programs and resources that are available to assist healthcare providers in rural and underserved communities and projects. September 2012 (HRSA Health IT and Quality Newsletter) - HRSA’s “Guide to Health Center Networks,” developed in collaboration with the National Association of Community Health Centers, is now available. This Guide is a user-friendly resource for HRSA grantees, safety net providers, and all health care organizations seeking information and technical assistance with their quality improvement and operational efforts. The Guide provides a central starting point to learn more about specific Health Center Networks and offers helpful tips to engage directly with potential Network partners. The Guide was developed to support stakeholders in their consideration and selection of a Health Center Network. The Guide includes valuable resources, such as data and tables, for helping safety net providers learn about health center networks. The Guide contains data from more than 40 Networks on quality and health care delivery improvement, operational management, and HIT in the safety net. In addition, the guide has 25 tables of data to enable the user to distinguish among the networks’ different approaches, services, and areas of expertise, including information on accreditation programs, membership options and existing member organizations, registries/data warehouses, personal health records, electronic mobile health applications, health information exchanges, interfaces, electronic health records, and central IT and administrative function support. HRSA hopes this guide will be a valuable resource for safety providers seeking information with their quality improvement and health IT operational efforts. September 7, 2012 (Daily Yonder) - Now that both political parties have finished their national conventions, we thought it might be time to see what their platforms have to say about issues that specifically affect rural America. Click below to read statements and excerpts from the Democrat party platform. Click below to read excerpts from the Republican party platform. September 7, 2012 (HHS News Release) - Health and Human Services (HHS) Secretary Kathleen Sebelius today announced that, for the first time, the public can vote to choose their favorite innovation from among the finalists of the HHSinnovates Program. Launched in the spring of 2010 as part of HHS’s Open Government efforts, HHSinnovates recognizes innovative projects led by HHS employees designed to help solve our country’s toughest health care challenges. August 31, 2012 (Beckers Hospital Review) - Healthcare reform is pushing the industry into uncharted territory. Healthcare providers must make decisions without precedent, and consumers are savvier than ever. Change this monumental cannot be achieved in a vacuum or with an insular approach. As a result, healthcare is borrowing lessons and business models conceived and implemented within other industries: hotels, automakers, media, retailers, service providers and financial institutions. As disparate as these fields may be from healthcare, they share the oldest and most basic economic concept: supply and demand. Richard Afable, MD, president and CEO of Hoag Memorial Hospital Presbyterian in Newport Beach, Calif., takes a basic perspective when comparing healthcare to other industries. "It's almost primal," he says. "The rules of supply and demand and consumerism are almost like gravity. They will always win the day. What's changing in healthcare is on the demand side. What people, employers, the government and retiree groups want is changing. That's what we're thinking about going forward. We're not trying to think about how to best adapt to [healthcare reform]." September 7 2012 (Urgent Communications) - Dichotomies between our nation’s urban centers and rural areas always have existed—culturally, socially and technologically—and likely always will. Medicine represents one of the widest gaps, perhaps one best described as a chasm. Generally, large cities and towns have better facilities and better-trained and more experienced practitioners than those found in small-town America. But this chasm potentially could be bridged—if not altogether eliminated—by a fast-evolving concept known as community paramedicine, which is made possible in large measure by broadband communications technology. September 7, 2012 (EHR Intelligence) - The attention that meaningful use continues to garner since the announcement of the final rule for Stage 2 Meaningful Use is likely to downplay the significance of perhaps more meaningful initiatives aimed at improving American healthcare both far and wide. The Centers for Medicare & Medicaid Services (CMS) Electronic Health Record (EHR) Incentive Programs incentivizes the adoption of health information technology (IT) under the premise that these systems will ultimately enable providers to offer their patients high-quality care. However, the question remains: Who’s truly benefiting from the billions in incentives — vendors, providers, or patients? September 7, 2012 (HealthLeaders Media) - The U.S. healthcare system operates like an ATM machine that takes days to release cash. It functions like a home construction project whose carpenters and plumbers use different blueprints. And it does business like a store that prices items depending on who is making the purchase. September 4, 2012 (SAMHSA) - This webcast describes how communities are organizing and networking to provide recovery support to people dealing with mental and substance use disorders, and highlights efforts to change the culture of communities to accept and embrace people in recovery. by Kathleen A. Barnes, B.S., Jason C. Kroening-Roche, M.D., M.P.H., and Branden W. Comfort, B.S. September 6, 2012 (The New England Journal of Medicine 2012, 367:891-893) - Reactive at best, unyielding at worst, the U.S. health care system has struggled over the past century to respond to the shifting burden of disease, improvements in technology, and population growth. But times are changing. Americans know that our system costs too much, reaches too few, and provides too little high-value service. Ideas for improvement have been percolating. The Affordable Care Act (ACA) expands coverage, emphasizes population health and primary care services, and establishes accountable care organizations that require strong primary care foundations.1 The patient-centered medical home model that is spreading across the country entails a commitment to promoting health rather than merely treating disease.2 With funding available from the Center for Medicare and Medicaid Innovation for experimenting with new ways of delivering health care, we believe the revolution has begun and that primary care has become exciting again. As three primary care physicians-in-training, representing both coasts and the Midwest, we share a vision of primary care as the key to improving health and health care in the United States. September 5, 2012 (HealthAffairs Blog) - The newly released September issue of Health Affairs contains several thoughtful analyses and proposals about how to change our approach to paying physicians and hospitals. It comes at a time when Washington policymakers begin an annual ritual of Kabuki theater, complete with its hallmark stylized drama and elaborate makeup: the so-called Sustainable Growth Rate, a recurring threat to cut physician payment in order to restrain Medicare costs. This year the proposed cut is 27 percent. The SGR represents an ongoing approach by some in both the public and private sectors to target physician fees as a lynchpin of cost control. Is it really a sound strategy to alienate the very people whose cooperation we most need to achieve a more affordable and equitable system? August 22, 2012 (The Commonwealth Fund) - Enabling health care providers to share in the savings they generate from the delivery of more efficient, higher-quality care is a promising way to achieve the goals of health reform. Reaching agreement on the methods used to calculate and distribute such savings, however, has been a challenge for payers and providers alike. By following a set of design principles, payers and providers may be able to sidestep some of the pitfalls encountered by early adopters of this payment approach. ACA Implementation: What's Happening on the Ground? September 10, 2012 (Robert Wood Johnson Foundation) - New additions to the Robert Wood Johnson Foundation’s ACA Implementation—Monitoring and Tracking Series analyze trends across 10 diverse states, providing insight into key health reform implementation issues that states nationwide are facing. Topics include: state insurance exchange development; plan participation and competition within the exchange; insurance rate review; and early market reforms. Video Dial-a-Doctor Seen Easing Shortage in Rural U.S.
September 5, 2012 (Bloomberg) - Until recently, when children in Ware County, Georgia, needed to see a pediatrician or a specialist, getting to the nearest doctor could entail a four- hour drive up Interstate 75 to Atlanta. Now, there’s another option. As part of a state-wide initiative, the rural county has installed videoconferencing equipment at all 10 of its schools to give its 5,782 students one-on-one access to physicians. Telemedicine sites for adults have also sprung in the area. Instead of taking a full day off from work or school, residents can now regularly see their specialist online.